Right now I am having difficulty typing this posting because my fingers are frozen stiff. Ladies and gentlemen it is cold in Chicago. Speaking of ice cold, lately I’ve been reading that ice is the new couture food. Wait – is ice a food? I guess it is if you are one of the stars of the new 90210. Regardless, right now it seems that ice has declared war on the cocktail for the top spot as “it” happy hour fashion accessory. Companies are launching products to make the ice stand out over the drink. Here are some examples. 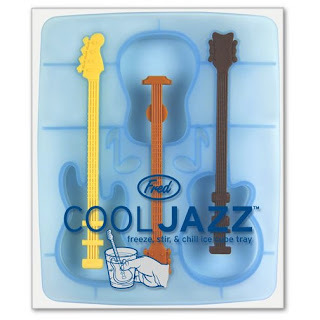 Rockstar Ice: Channel your inner Slash with guitar ice from Uncommon Goods. These would be totally cute in a signature drink made with Rockstar energy drink. Many at a Guitar Hero party? 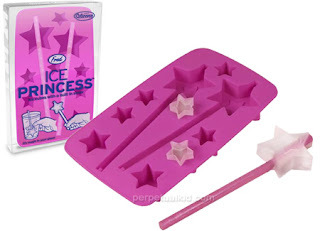 Ice Princess: Hosting a princess party? That probably means you have a small child. Or you are a 27-year-old that acts like a child. Regardless, these fairy want ice cubes from World Wide Fred are perfect for the adult beverages. 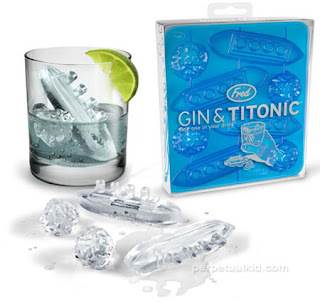 I’m King of the World: Above is of the most buzzed about new ice products out there - the Gin and Titonic. Drown down a drink with these fun cubes from Perpetual Kid. This set comes with four ocean liners and four ice burgs. Rrrrrrr: If you are a Chi Omega or a Pirate, you will love this ice option. 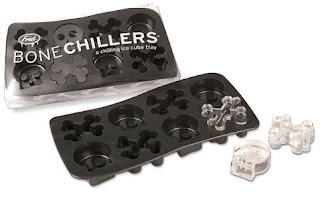 Spoon Sisters sell Bone Chillers – a cool skull and cross bone. These are perfect for a pirate party or toasting another losing season at a Pittsburgh Pirates tailgate. Remember earlier this summer when I mentioned alcholo-pops? Well I had some batch left over and I poured it into my star ice mold for some quick shooters. They were also a tasty way to chill a glass of champagne! These options are just the tip of the iceburg of the plethora of options for keeping your favorite beverage cold. Keep your eye out for ice bling, ice kabobs, slim ice sticks for your bottled water, etc. Search these sites for some cool options.